Book a Trip and Rates! I went to Don Pedro on Valentines Day to see what was happening at the reservoir. The lake was pretty much full, the water was in good shape as far as color one just has to watch out for floating debris. We started fishing and it wasn’t long and the starboard side rod started burning line off the real, Butch grabbed the rod and started fighting the fish, it started jumping out of the water and made some good runs, this was no small fish and we seen the fish as it swimming along side the boat and as I went to net it, it started thrashing around as I scooped at the fish and thought it was in the net, I came up empty and broke the lure off in the process. 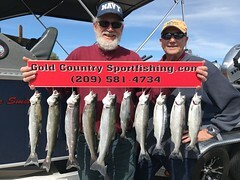 We continued to work the area for one more strike, so we moved on just fishing and we finally found and area that had fish. 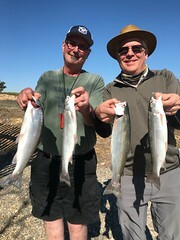 The action was not red-hot but we a steady bite with some very nice trout. We let several fish go and there were some very nice fish caught on this day. We kept six rainbows and let four others go back to fight another day. Its gonna be a great year at Don Pedro this year. Book your trips now with me and get in early on the great size of fish. 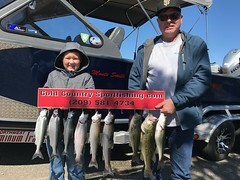 This entry was posted in California, Don Pedro fishing guides, Don Pedro Lake, Gold Country, Gold Country Sport Fishing, Rainbows, Trout, Winter Fishing. Bookmark the permalink. Content copyright 2008-2013. Website design and SEO by Lynn Albro; http://lynnalbro.com. All rights reserved.